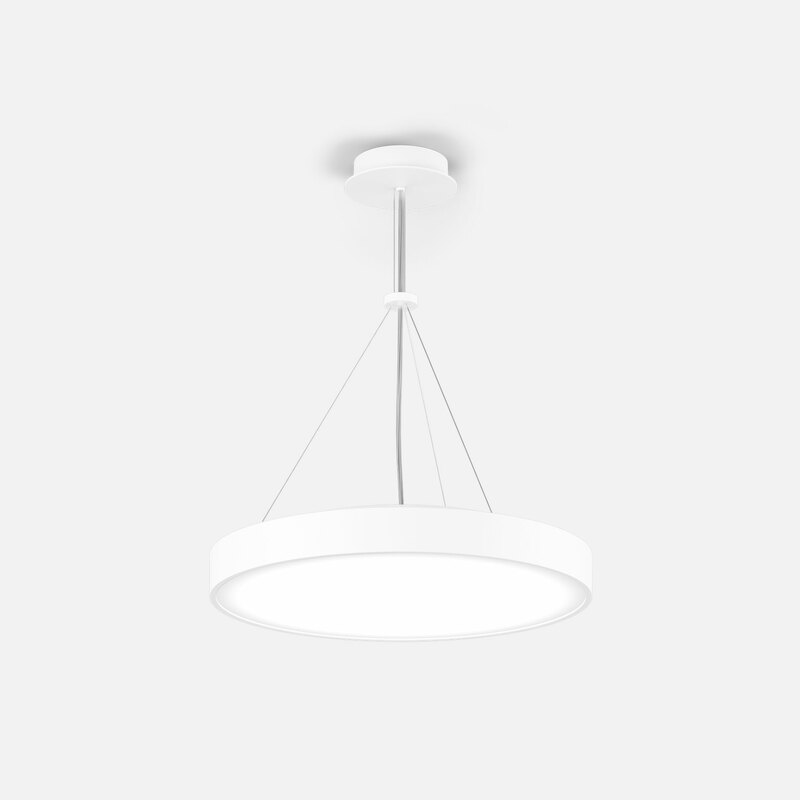 Round luminaire housing in aluminium, rolled profile, seamlessly welded; surface powder coated in white, grey, dark grey, black, beige or dark brown; Suspended luminaire with 1500mm cable suspension; with integrated tool-less suspension height adjustment; incl. transparent feed or with height adjustable rod suspension (chrome), feed in rod; highly reflective coating for improved efficiency; completely homogeneously illuminated, satinised PMMA cover; up to ø600mm: microprismatic PMMA cover; workplace light suitable for VDUs according to DIN EN 12464-1 (UGR < 19); direct/indirect illumination characteristic for additional emphasis of the ceiling and more visual comfort; same light density for all surface lights with the same components (e LED, e² LED or e2+ LED); energy-efficient LEDs with very good colour rendering; binning initial ≤ 3 MacAdam; available in the light colours 3000K and 4000K; CRI ≥ 80; min. 80 % of the luminous flux after 50000 hours; canopy with 2 cable openings and plug-in terminal for through wiring; protection class IP 40; PC I; DALI dimmable with CLO function; optional non-dimmable.